Visit Click Tale online at ClickTale.com for innovative In-Page Web Analytics that reveal the mystery of what visitors actually do inside website pages, allowing you to analyze and optimize website performance and usability. Click Tale's unique solution provides movies of your visitors' actual browsing sessions, heatmaps of aggregate behavior inside the web page, and advanced behavioral analytics. 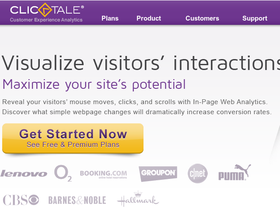 ClickTale fills a gap left by traditional web analytics that only measures activity between pages. Be sure to check back often at 58Coupons.com for the latest Click Tale savings, Click Tale promotions, Click Tale discounts and Click Tale coupons. Act now to get 25% off your online order of a Silver yearly subscription from ClickTale.com. Save $2610 per year with this offer! Click to view. Save 10% when you use Click Tale for 6-months or longer! Click link and sign-up. Sign up now at ClickTale.com and get 3 months free when you purchase any plan. Click link to get started. Sign up today at Click Tale and try it absolutely free. Click link for details.